Last month I reviewed Elysium after reading the rulebook and everything else I could find on it. I normally don’t review a game until I’ve played it, but with the pre-release coming up I felt it was important to give everyone a heads up about what it’s about. Since then, I’ve taught and played Elysium several times and would like to share my thoughts on it. Elysium varies a lot depending on which families you choose to use. I really like that, as it provides lots of variety and replayability. For example, in the games using the families the rulebook recommends for your first game (Athena, Hades, Hephaestus, Poseidon and Zeus), scores seem to range in the 40s and 50s with little interaction and chaining among cards. However, a game with the other three families (Apollo, Ares and Hermes) plus Hades and Hephaestus ended with scores in the 90s and 100s! The games with Hermes had a lot more card interactions and chaining, same with Apollo and the Oracle. Whenever you play with Apollo, you must use the Oracle. 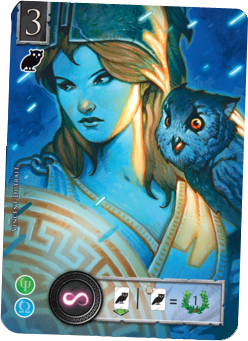 The Oracle, provides a preview of some of the cards that will be available in the next round. Some Apollo cards let you acquire cards or use the powers of cards in the Oracle, while others allow you to add more cards to the Oracle. I like the Oracle: I think it adds another layer of strategy because you can plan ahead – at least a little – based on the upcoming cards. One variant I’d like to try involves utilizing the Oracle, but without the Apollo cards. Being able to change up the families also lets you control the type of game you want to play. 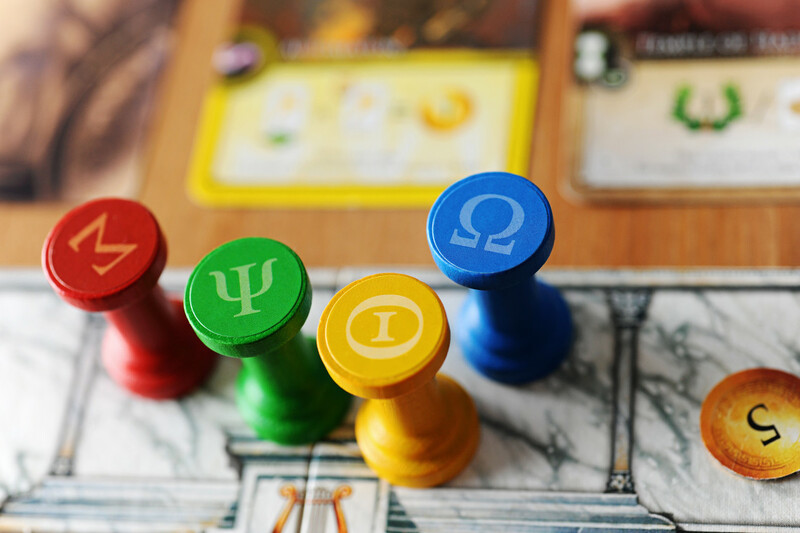 I don’t like the “take that” cards – it’s not a mechanism I care for in games – so given the choice, I leave out Poseidon. I expected the Ares cards to be the most combative – he’s the God of War, after all – but Poseidon messes with other players a lot more by forcing your opponents to give up gold, victory points or even cards from their Domains. This is the complete opposite of Athena who grants you some gold, victory points and/or another benefit, then allows your opponents to share in the bounty, though to a lesser extent. Hephaestus is another generous god – at least with money. Scores will likely be higher when you include Hades and/or Ares in the game. Many Hades cards provide additional transfers to your Elysium. With more transfers available, scores will correspondingly increase. Ares will have players fighting for the majority of Prestige Points (PPs), not to be confused with Victory Points (VPs). At the end of the game, the player with the most Prestige Points scores 16 VP, the next 8 VP, then 4 VP and 2 VP. If you have 0 PP, you’re not eligible for any Ares VP. Sixteen victory points is significant. As with most strategic games, initial playtime is longer with players learning the iconography and getting use to the agonizing choice of which column to give up when acquiring a card. Later plays are much much shorter, so don’t let the length of your first play lead you to believe that Elysium is a long game. Bottom line: I like it. The components are all they promised to be in terms of quality, gorgeous artwork, etc. 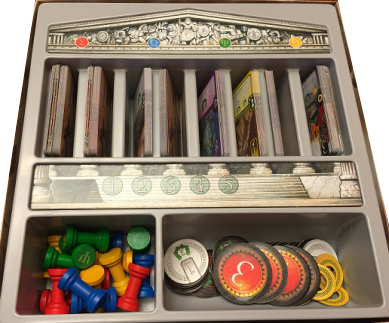 I love the extra touches like the inside of the box looking like a Grecian temple. My only gripe is I wish the family icons were a bit bigger in the card corners. People keep asking me what game Elysium is like and I’m still stumped for an answer. 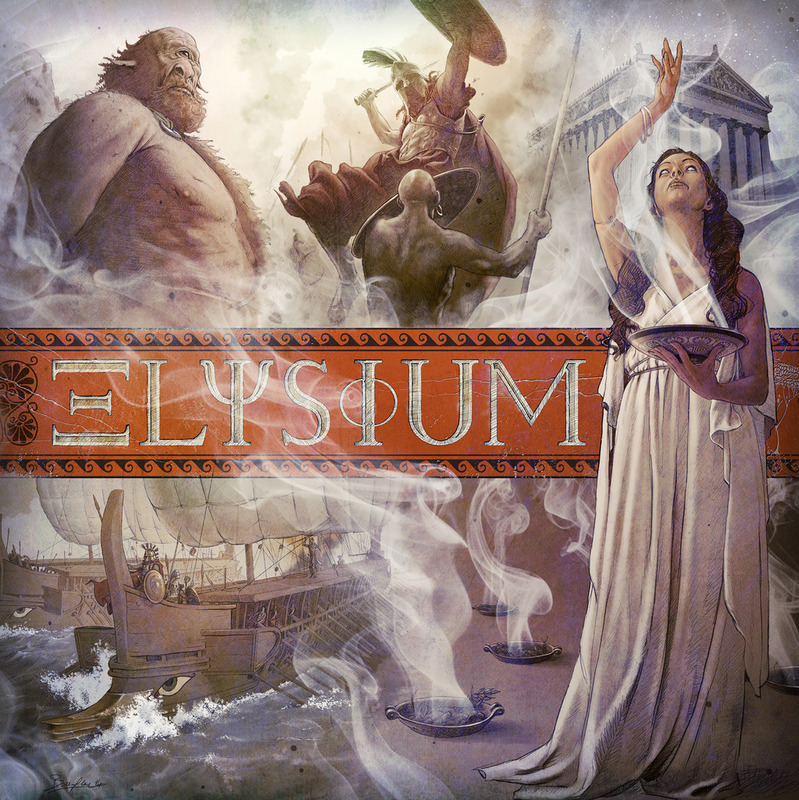 Elysium is unique and fills its own special niche. There’s card drafting, but in a new way. There’s set collecting, but implementing your sets for scoring and deciding when provides its own set of choices. I can’t think of any game I can say it is like. I haven’t played anything quite like it, so it’s earned a place on my shelf.